The first Dr. Martin Luther King Jr. service project at the Southern Illinois University Edwardsville East St. Louis Center (ESLC) included a unity walk around campus, a call to action, and a poster contest illustrating influential and successful East St. Louisans. 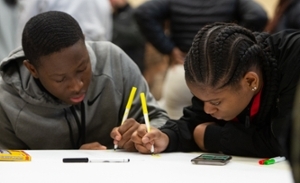 More than 50 SIUE students, including those from Collegiate 100, Black Girls Rock and Delta Sigma Theta Sorority, joined 120 SIUE East St. Louis Charter High School (CHS) students on Friday, Jan. 18 in recognizing King’s life and legacy with activities designed to honor accomplishments of the past and motivate action in the present. “SIUE’s connection to the East St. Louis campus is critical,” said Tarsha Moore, assistant director of the Center for Student Diversity and Inclusion (CSDI), who originated the idea of a service project at the ESLC. “We are eager to pay it forward by instilling SIUE values to the younger generation, and we have a pipeline with the Charter High School students. Dorsey referenced the speech, “Remaining Awake through a Great Revolution,” that King gave June 14, 1965 at Oberlin College’s commencement address. The students closed out the project with drawing and decorating East St. Louis historical figures. Students read about their subject matter from Reginald Petty and Tiffany Lee’s book, Legendary East St. Louisans: An African American Series, which was on each table. Some of the famous East St. Louisans illustrated by students included Bryan Cox, Miles Davis, Katherine Dunham, Dr. Larry Gladney, Reginald Hudlin, Jackie Joyner Kersee, Dr. Lillian Parks, Dr. Barbara Ann Teer, Judge Milton Wharton and Dr. Katie Wright. Justin Ufheil, a junior majoring in social work, has volunteered in East St. Louis at least once a month for the past three years. “This event is exactly what Dr. King envisioned in his 'I Have a Dream' speech,” said CHS Director Gina Jeffries. 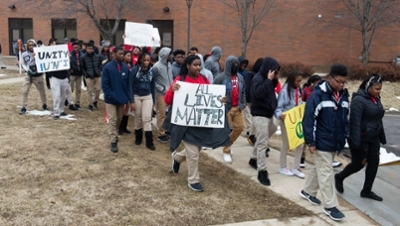 Students from SIUE and the East St. Louis Charter High School (CHS) participate in a unity march as part of the first Dr. Martin Luther King service project on the East St. Louis Center campus. 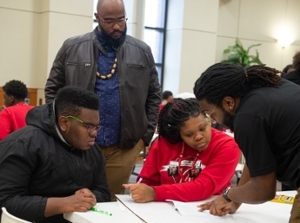 Working on their portrait of a historic East St. Louisan are CHS seniors Jamerson Williams (left) and Jasmine Whitley, with help from Reginald Hamilton of SIUE’s Collegiate 100. Observing is Dominic Dorsey II, Accessible Campus Community and Equitable Student Support (ACCESS) director. Intent in their drawing of an East St. Louis historical figure are CHS students Jairen Robinson, sophomore, (left) and DaiViyonna Jenkins, freshman.